Their proton beams flared out, lashing the subtle particles into violent motion, and reducing them to fragments too fine to be visible, even if magnified a thousand diameters. The entire atmosphere within the war turret was submitted to the sterilizing action of the beams. Any living thing in the paths of the protonic storms from the pistols, must surely have been destroyed. It turns out that Gallun was right about the effects of these "protonic storms" on living cells. In deep space, protons are the most abundant type of charged particle. Scientists at the NASA Space Radiation Laboratory at DOE's Brookhaven National Laboratory have recently discovered that proton radiation is more damaging to cells that was previously supposed. This means that future space missions, particularly lengthy missions to Mars, must take additional precautions. "Scientists have been assuming that protons damage cells in a way similar to x-rays, but our results indicate that these assumptions have been wrong. The new data show that protons produce more potentially lethal double-strand breaks, a type of severe DNA damage, than other kinds of DNA damages,” said Brookhaven biologist Betsy Sutherland, the study’s lead researcher. “This means that scientists don’t really know how human DNA is affected by the most numerous particles in space and, as a result, do not know how to design the proper protection for astronauts." Sutherland and her group are now working with human cells irradiated by the same beams. Their research has shown that the use of low-energy protons in cancer treatment may need to be reexamined; improvements in cancer therapy could follow. One local source of energetic protons is our own Sun; read about how solar activity has been shown to affect space missions throughout the solar system in Solar-Powered Interplanetary Shock Tracked To Saturn. Take a look at a "new" idea for shielding spacecraft in NASA's New Radiation Shielding First Proposed By John W. Campbell In 1936. 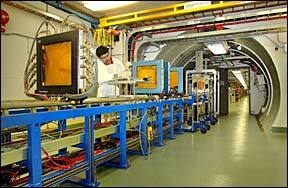 Read more about Proton radiation more dangerous than once thought.